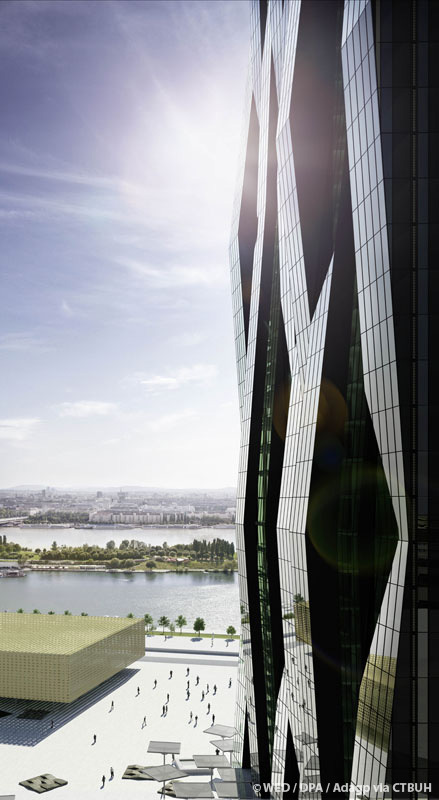 Austria’s DC Tower 1 has become an invaluable landmark of the Donau-city in Vienna. The building comprises an entirely new urban district with a diverse range of functions: offices, a four star hotel, apartments, a sky bar, a public open space, restaurants, and a fitness center. 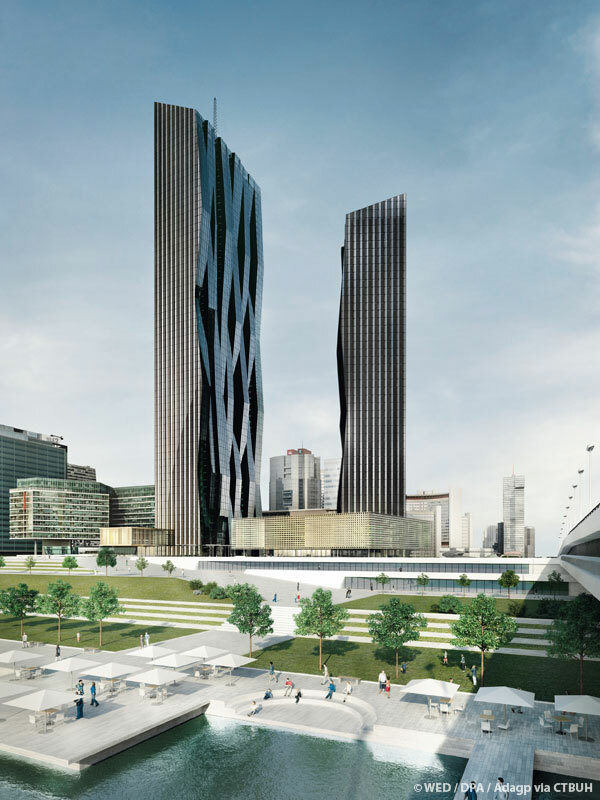 The folds contrast with the no-nonsense rigor of the other three façades, creating a tension that electrifies the public space at the tower’s base. The façade’s folds give the tower a liquid, immaterial character, a malleability constantly adapting to the light, a reflection or an event. 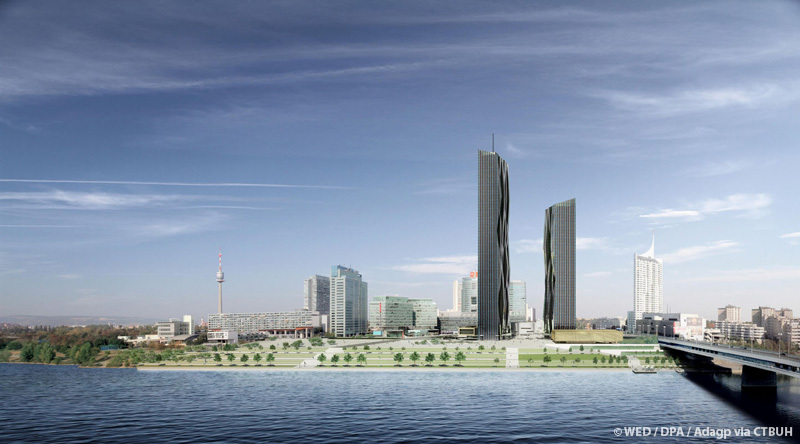 Dancing on its platform, the tower is slightly oriented toward the river to open a dialogue with the rest of the city, turning its back on no one, neither the historic nor the new Vienna. 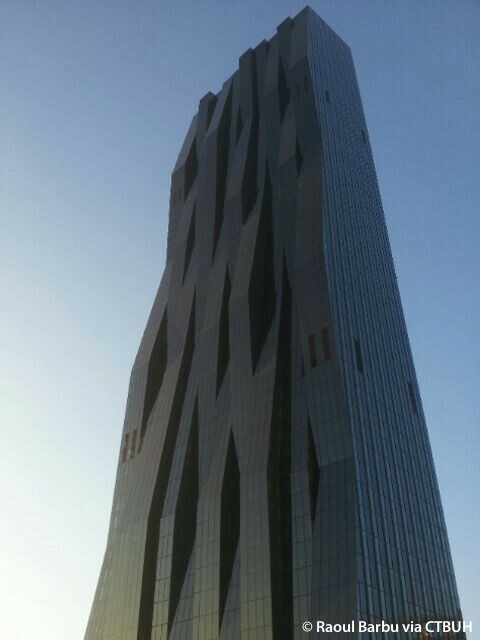 A subtle game of flat and folded façades affords the glass and steel tower a sensual identity. The aim of the designers was to get the basic horizontality of the city and the public space to coincide with vertical trajectories. On the back façade, the public space rises from the level of the esplanade in a series of staggered steps to reach the ground reference plane. This structuring of topography launches the tower and creates a spatial interface accessible to all, making the occurrence of such a physical object both possible and acceptable. 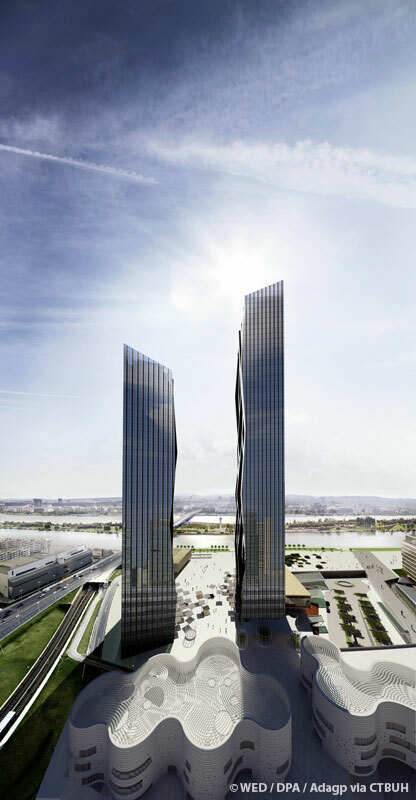 On the other three façades, 54 metallic umbrellas gradually rise from the ground on the approach, softening the hard edges of the project and blending city and movement into the tower’s future. Important work on neighborhood fringes remains to be done to reveal the geographic features of this urban landscape and take better advantage of the river bank. 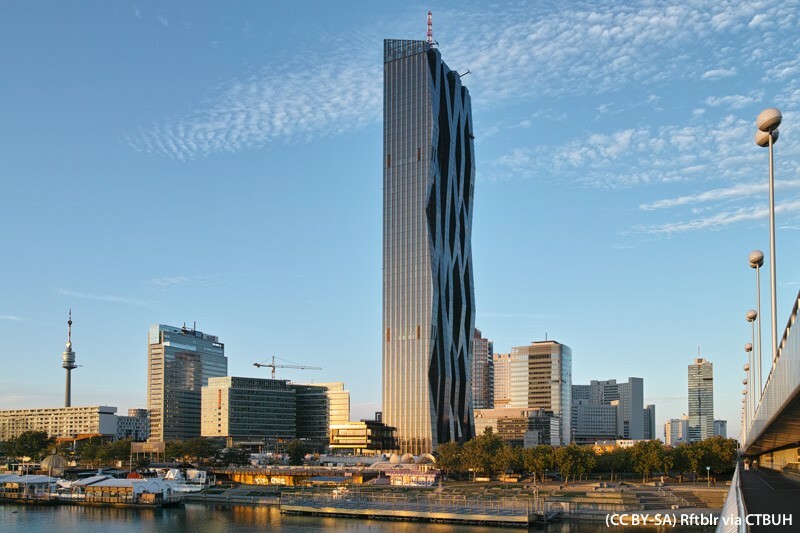 With this first substantial tower, the city of Vienna has demonstrated that the punctual and controlled emergence of high-rises can participate in creating the city and produce contemporary, economical, high-energy performance mixed-use buildings, adapted to metropolitan business requirements and lifestyles. 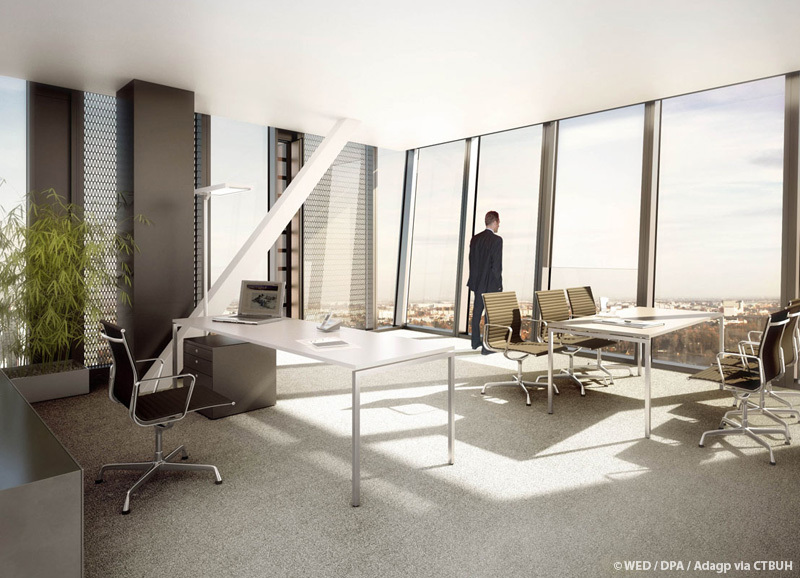 In each office, openings provide natural fresh air. 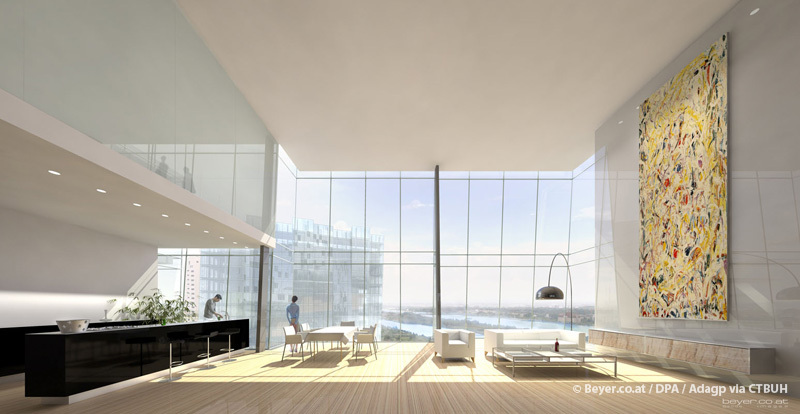 The curtain walls are composed of three different glass layers, so as to provide solar protection. 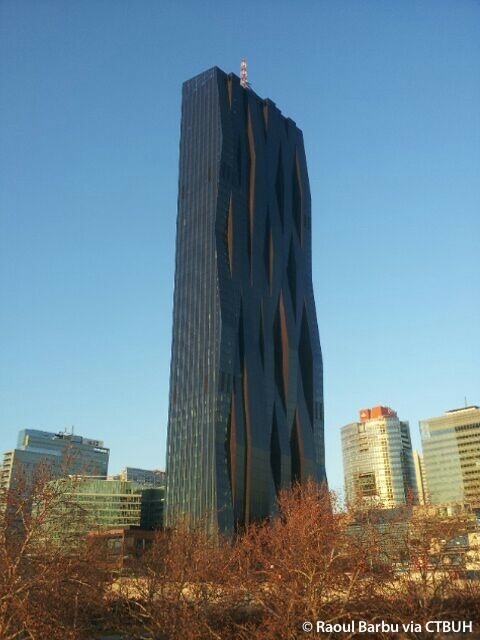 Active floors, used to a large extent in the tower, minimize energy consumption by reducing the volume of air flow to exactly match the thermodynamic heat load. Water recycled from the adjacent Danube River is used for the cooling process. At the bottom of the tower, the connected building is provided with photovoltaic roofing and thermal barrier coatings (TBCs), which serve to insulate components from large and prolonged heat loads by utilizing thermally insulating materials, which can sustain an appreciable temperature difference between the load-bearing alloys and the coating surface. Moreover, on the square, large sunshade screens made of perforated black panels provide shelter for pedestrians and act as wind breakers as well. 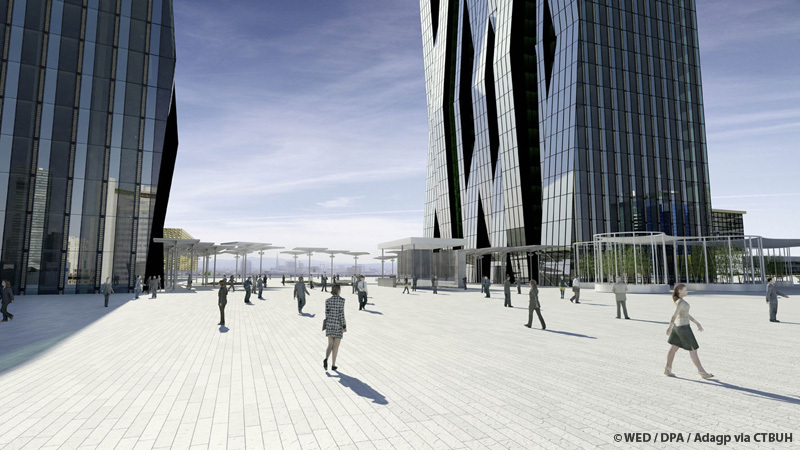 Some of these umbrellas on the lower square are planned to become supports for plantings, in the second development phase, supported by an automatic watering system. The project is in the process of obtaining LEED Gold certification.